A property targeted for new (and expedited) development as a high profile branch bank in a transitional urban area with extensive use history. The site was an abandoned auto repair and service station facility with “closed-in-place” tank systems and multiple buried sources for hydrocarbon and solvent release to the environment, surrounded by multiple dry cleaning (active and historical) with Leaking Petroleum Storage Tank (LPST) facilities undergoing active case management. 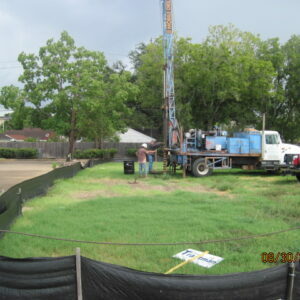 TGE performed comprehensive due diligence to locate and quantify affected property; we installed and sampled multiple wells to comply with state requirements. 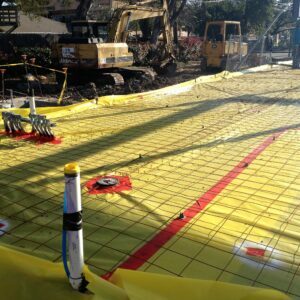 Additionally, we prepared and implemented remediation strategies to remove all existing equipment, tanks, fluids, and regulated wastes (including locally impacted soil). 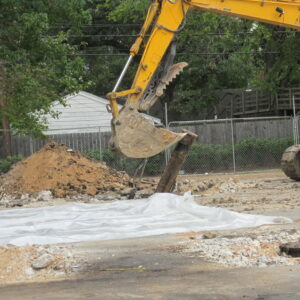 TGE also designed and installed a protective Vapor Intrusion Mitigation System (VIMS) during site redevelopment. A fully remediated, “case-closed,” redeveloped commercial facility that does not put employees at risk of exposure in their workplace, nor present elevated risk for the property owner.